Wedding flowers are my no means limited to bridal bouquets and boutonnieres. A vibrant display of blooms can play a big part in your wedding décor, especially on a tropical island, and can set the theme for other aspects of the celebration. A kaleidoscope of chalk-white beaches, azure seas and coral-pink sunsets are enough to make the photos from any destination wedding album pop. However, couples who want to paint even more colour into their tropical island ceremony will find that a private villa is the perfect place to get creative (and colourful!) with the décor. Islands like Phuket, Koh Samui and Bali are home to a vibrant array of flora , whether you are searching for blooms with funky shapes or those that will add intense splashes of colour. Brides and grooms who are bored with tradition will also find that using a flower décor theme will open up a whole new world of original design possibilities. 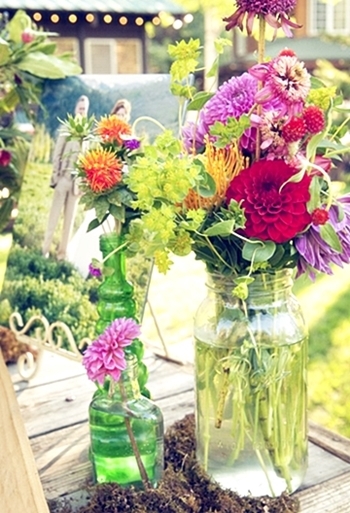 To keep things hip and quirky on your wedding day, why not add a rustic decorative twist to your centrepieces by displaying flowers in jars? Jars introduce a quaint, vintage feel to the overall décor and are easy to customise with coloured ribbons and bows so they match your wedding’s wider themes. Couples that want to go all out with lashings of intense colour can opt for coloured jars, or even paint the jars themselves prior to the big day. 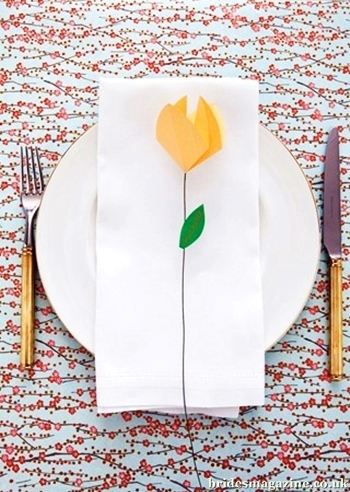 If a conventional, folded cardboard place setting is not for you, then look no further than a nifty “Name Tulip”. These origami-tulips won’t wilt under the hoti sun, and can be made by hand in a rainbow of colours. Guests could even have a go at making their own tulips at an ice-breaking crafts table before the wedding festivities get underway. To make your tulip, begin with a square piece of paper and fold it in half four times, unfolding each time, to make four creases. Next, fold the paper in half again to make a triangle shape. Fold the creases nearest to the base of the triangle to create a diamond shape. Next, snip the paper into a cute petal shape before making a small hole where all lines meet in the middle. Place a piece of gardening wire through the hole to make a stem, and attach a small green paper leaf to write the name on. Hey presto – you have an elegant “Name Tulip”. If elaborate centrepieces, table runners and place settings are not enough for you, have a go at adorning the backs of guests’ chairs with colourful cascades of flowers. Your wedding planner can help you find the freshest blooms from a local florist to co-ordinate with your wedding’s colour theme. 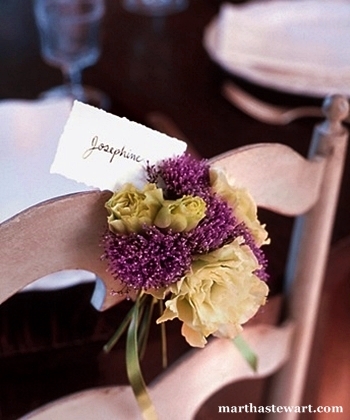 Chair-back bouquets can also be used as unusual place settings, although guests may need to be careful to avoid getting any pollen on their clothes. Another upside of flowery chair backs includes the fresh scents they give off throughout the day. If a stunning beach backdrop isn’t enough for your wedding album, why not opt for a floral one? Add some spice to outdoor photographs by making delicate flower chains and hanging them from tree branches. Many of Southeast Asia’s private villas are home to extensive grounds and while making a few flower chain hangings guests can also enjoy posing for a couple of snaps. 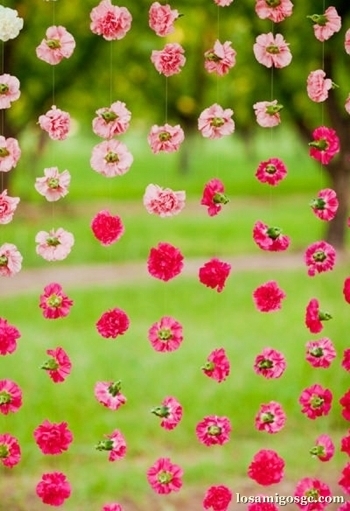 Couples that want something a little more formal can hang a vibrant piece of floral fabric from a pole so it cascades to the floor for a floral “red carpet” effect. This offers kids the perfect place to have some fun posing for wedding photos too. Many brides and grooms now pay an increasing level of attention to decorating food and drink at their wedding. The wedding cake is one of the most important focal points of the celebration, and adding a cascade of sugared flowers to the cake so it matches the bridal bouquet is sure to make it stand out. Couples that don’t want real blooms adorning their cake can even use delicate tissue paper flowers to increase the dramatic effect. 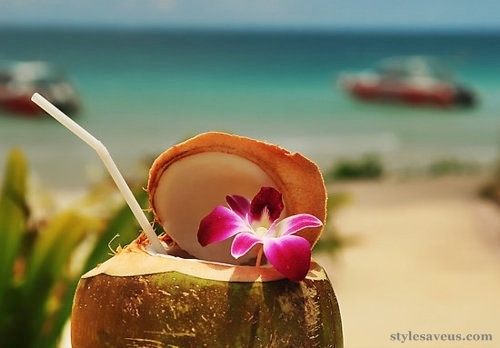 For the ultimate tropical wedding, make sure all drinks are served with a garnish of tropical flowers too.